Sometimes it takes some time for bands to get themselves centered after line-up changes shake things up. 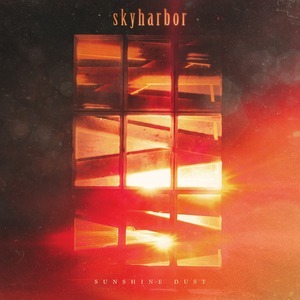 The last release from Skyharbor was 2014’s Guiding Light, and since that time the band lost vocalist Daniel Tompkins and drummer Anup Sastry. So with such grand changes, it allows for some band-level evolution, and Sunshine Dust, as the first release since that point is a showcase for their direction to come. The unfortunate part is that it feels a bit disjointed at times. The modern prog and post-metal vibes of Skyharbor are certainly still present, and the floaty first trio of tracks shows the band moving past the membership changes pretty unscathed. Vocally, Eric Emery has the soothing/soaring clean vocal down and sounds excellent, and can move into the scream territory when necessary. As the album progresses some more electronic and rock influences take a larger focal point within the material, which also feels suiting for the band – while it’s less ‘metal,’ good songwriting is still good songwriting. The problem lies in that sometimes, with the length of the album, it starts to feel like a bit much. It’s a long release, and it’s only towards the end that some heavier punches come in the listener’s direction. And that being said, those heavier punches contrast significantly from the dreamy feel of some of the preceding tracks. “Dissent,” “Menace,” and “Temptress” swerve into Deftones/KoRn territory with fluctuating success (“Menace” being the strongest of the pack) but they do tend to throw the listener for a loop, even if they do provide some increased variation, as they feel a bit left of center from the album as a whole. Sunshine Dust has its moments of glimmering beauty and metallic grace but ultimately falls short due to a bit of an identity crisis. It’s nothing that the band can’t recover from, as the pieces are in place for success. It’s a matter of choosing a direction, and perhaps cutting down the runtime a little bit for clarity’s sake.